It's almost Sukkos and Dovy is so excited! But he wonders, "Why don't we just eat inside our house on Sukkos? Why do we need a sukkah?" Join Dovy in his great Sukkos Discovery -that Hashem is always watching over us and protecting us, wherever we are! A great Emunah-boosting book! 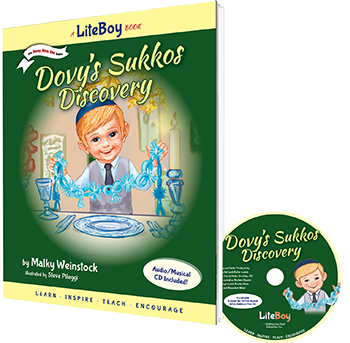 Dovy's Sukkos Discovery picture book plus audio CD set. Dovy prepares for the Seder by practicing the Mah Nishtanah. Join Dovy at his special Seder where he learns why Pesach is such a special Yomtov! Just as Hashem took us out of Mitzrayim, He will take us out of galus so soon, we hope, L’shana Haba’ah B’Yerushalayim! Enhance your own family’s Seder preparation with this special book!! 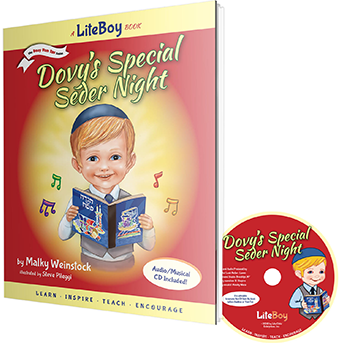 Dovy's Special Seder Night picture book plus audio CD set. Dovy gets a new train that he simply loves playing with and--not surprisingly--finds it so hard to share with his friend Mendy! 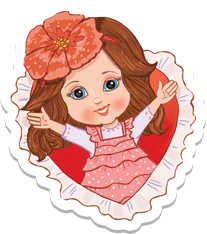 Sharing is something young children often stuggle with. With this charming book, your little one(s) can grow along with Dovy as he learns to share! 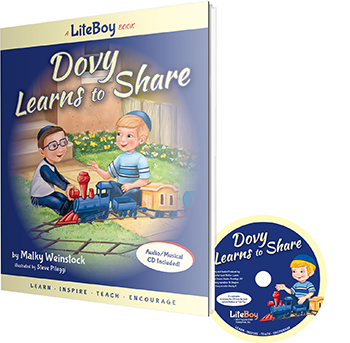 Dovy Learns to Share picture book plus audio CD set. In this second book of the LITE Boy series, Dovy gets to spend an exciting day with his Uncle Benny! 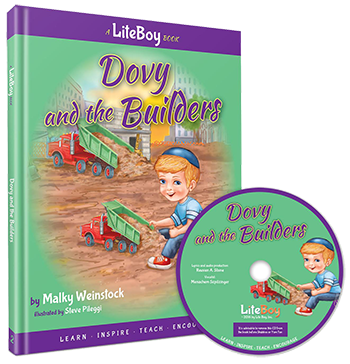 Dovy's uncle is a builder, and as he shows Dovy his construction sites, he also teaches Dovy an important lesson-We can all be builders, when we build ourselves up to be great Jews! On a lighter note, specially attuned to little boys' fascination with vehicles and building equipment, this book is every little boy's dream! Dovy and the Builders picture book plus audio CD set. 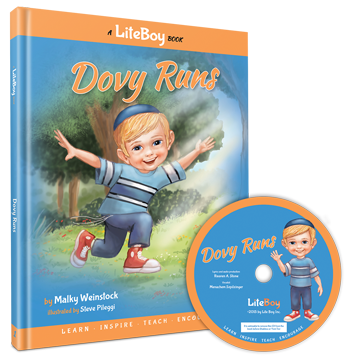 Hurray for the launch of the LITE Boy character Dovy picture book/audio series! In this introductory book, meet adorable, rambunctious Dovy who loves to run--as most boys do!-but sometimes gets into trouble doing so! Follow Dovy as he learns a valuable life lesson: that every middah is good in the right time and place! Dovy Runs picture book plus audio CD set.